Kudos for joining a growing group of men who are changing the world by actively supporting gender equity on campus, in the workplace, and at home. 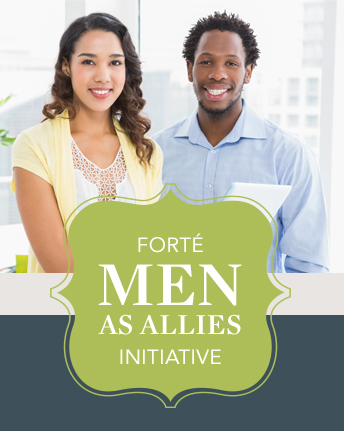 In 2017, Forté launched our Men as Allies Initiative, a pioneering project to help men support their female colleagues within the b-school environment. This initiative included a toolkit developed specifically for business-school audiences. Due to popular demand, we’ve now created a user-friendly toolkit for the corporate audience. This toolkit will help you understand what it means to be a male ally at work, why companies start male ally groups, and how they go about it. It walks you through the key elements to consider in launching your male ally group, provides a roadmap to get you started, and shares male corporate ally models at every stage of development. Click "Send Me The Toolkit" below and we will send you a copy of the corporate toolkit. Please include your name, title, company, and contact information. MEN IN ANY ROLE: Individual contributors, line managers, mid-level executives who want to learn about gender equity and to understand how they can become a more active player in supporting gender equity initiatives. MALE ALLIES: Men who are interested in learning about ally groups and want to know how to start a male ally group in their company. WOMEN who lead or participate in a Women's Network at their company and are interested in ways to get men more actively involved, to foster the creation of a male allies group, and/or to partner with existing male ally groups. SENIOR LEADERS: Men and women who sponsor and participate in gender diversity efforts in their organization and want to explore how a male ally group can strengthen the company’s Diversity & Inclusion focus. HUMAN RESOURCE PROFESSIONALS who seek to learn about the power and potential of male ally groups and are considering launching a male ally initiative in their organizations. MEN AND WOMEN who realize that by working together, they can accelerate gender diversity progress, which can benefit their companies, their colleagues, and themselves.